This contemporary styled loveseat from Boss Office Products features premium CaressoftPlus™ upholstery. CaressoftPlus™ is an ultra-soft and breathable material that has the look and feel of top grain leather with the low maintenance and durability of vinyl. 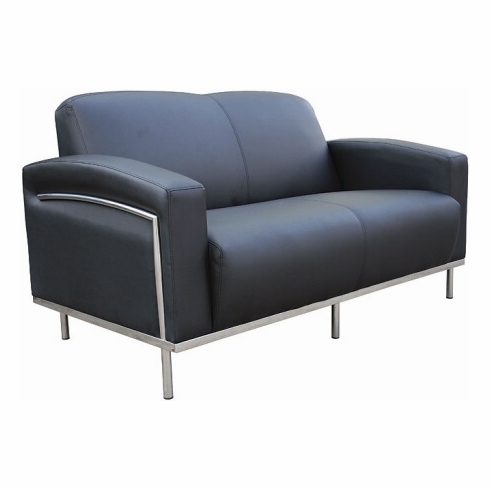 Other features include two section loveseat with thickly padded seat and backrest cushions, integrated box style padded arms and a polished and partially exposed stainless steel frame with stainless steel legs for added stability. This contemporary loveseat meets or exceeds ANSI/BIFMA standards. Matching lounge chair and sofa also available. Dimensions: Seat Size: 47"W x 20"D. Arm Height: 24.5"H. Seat Height: 18"H. Overall: 31.5"H x 58.5"W x 32"L. Six year limited warranty from Boss. This loveseat normally ships within 2-3 business days from either our CA or GA warehouse.